The heritage of Xian and the classic French hospitality of Sofitel combine to create a stunning 5-star hotel welcoming business and leisure travellers to the heart of the city. Sofitel Xian on Renmin Square is located very centrally within the Xian city walls near many historical sites including the Bell Tower Great Mosque Forest of Steles & Yong Xing Fang. The airport and Terra Cotta Warriors are both a 45-minute drive. Each Sofitel is a unique blend of the French art de vivre and local refinement. Sofitel Xian on Renmin Square brings a touch of French elegance to this ancient city. Like the Silk Road linking China and Europe, Sofitel Xian serves as a cultural bridge. Sofiel Xian embodies love of the arts. Engage your creative senses through theater, art, gastronomy, contemporary design and delicate luxury, immersed in centuries of ancient history. Rediscover your joie de vivre in our extensive landscape gardens. Feel fantastique with a touch of French elegance at Xian's 5-star luxury hotel. From sophisticated flower decorations to wonderful perfumed aromas, Sofitel Xian brings French spirit to the heart of China. 178 luxurious rooms and suites with elegant furniture and chic decor. A rainforest shower, the exclusive Sofitel MyBed, broadband WiFi Internet and 3G tech, bring you the "French art de vivre" of Sofitel. Overlook Xian and the hotels picturesque gardens from the luxury of the Junior and Prestige Suites. Lounge in the plush Sofitel MyBed beneath the rainforest shower or in your private living area. Enjoy WiFi in your work area and throughout the suite. 36 SQM / 390 SQFT, Modern Design, Sofitel MyBed, Bathtub & Shower, Lanvin Bath Amenities, High-Speed Internet access. 36 sqm, 390 sqf, equipped with Sofitel Mybed. Complete with a modern design, separate shower and bath, high-speed Internet access. 44 sq.m. (475 sq.ft. ), equipped with Sofitel Mybed. Complete with a modern design, separate shower and bath, high-speed Internet access. Boasts a panoramic view of the City/Gardens. 44 sqm, 475 sqf, equipped with Sofitel Mybed. Complete with a modern design, separate shower and bath, high-speed Internet access. Boasts a panoramic view of the City/Gardens. 70-110 sq.m. Elegant design living and dinning area separated from the bedroom. 1 king-size bed room, bathroom separate bathtub and shower compartment. Spacious wardrop area and Studio Kitchen with 2 door fridge. Guests in executive floor rooms and Prestige Suites savour exclusive privileges including all day access to the Club Lounge with its private breakfasts evening cocktails plus light snacks and beverages through the day. Additional privileges include express check-in and check-out pressing of 2 garments per day daily newspapers complimentary in-room internet access and 1 hour of in-lounge access per day as well as up to 1 hour of lounge meeting room usage per day. When you want to delight in our luxuriously adorned rooms, there is no need to forgo culinary pleasures. Tempt yourself with various international dishes, including French and Chinese. Comfort food is delivered to your room at your convenience. Savour gourmet Xian dining in the hotel's elegant restaurants. The cuisines of the Mediterranean delight in all-day dining restaurant Azur. Explore the globe in signature Brazilian and Chinese restaurants. Unwind amidst 5-star luxury in the bars of Hotel Sofitel Xian on Renmin Square. Lush cocktails and sumptuous snacks await in Bar Bambu. Brighten up your evening with the live music in Habana. Dining under the trees at Churrasco, sample Brazilian barbecued delights. Dolce Vita's Italian Chef de Cusine presents authentic Italian dishes in a decadent setting. Le Chinois offers a selection of home-made local dishes as well Cantonese and Sichuan tastes. Le Chinois is the most prestigious restaurant in the city. We serve authentic Shaanxi cuisine and contemporary Cantonese cuisine. The Restaurants are located within Renmin Square complex. An all- day restaurant serving the best of Mediterranean and European cuisine. Features an open show kitchen. The soothing aroma of fresh coffee, specialty teas plus refreshing cocktails and sumptuous snacks amidst the serene and sophisticated ambience of this lobby bar with live entertainment. The Sofitel Convention Center is the largest business venue in the region and includes a 1,100-square meter pillarless Grand Ballroom accommodating up to 1,000 people for cocktail functions. The ballroom can be divided into three separate areas. There are nine additional meeting rooms that can accommodate from 20 to 150 people. The Ballroom and all meeting rooms are equipped with hi-tech audiovisual equipment and simultaneous interpreting facilities. An additional 21 meeting rooms offer you a wide choice of venues all with WiFi and advanced technology. Together with its 2 sister hotels 900 Renmin Square hotel rooms await your guests. Sofitel Xian on Renmin Square accommodates wedding guests in 414 luxury hotel rooms and suites. Together with its two sister hotels in Renmin Square, up to 800 rooms are available, welcoming even the largest wedding parties. Delight in a wedding banquet of Chinese specialties, a sumptuous menu of French gourmet cuisine and delicate patisserie, or a culinary fantasy designed with the InspiredWedding Planner and Sofitel Xian on Renmin Square's expert chefs. Imagine your dream wedding and let Sofitel's InspiredWedding Planner take care of all the details. Sofitel Xian on Renmin Square boasts an exceptional events team with the expertise to handle every detail of your special day. Create an array of spectacular events with a wide variety of venues: a luxurious banquet in the Grand Ballroom, a reception amidst the manicured gardens and its fountains, a day of spa indulgence for the bride-to-be and friends... The choices are endless. Sofitel Xian on Renmin Square is located in the very heart of Xian near the landmark Bell Tower. The luxury hotel is 45 minutes from Xian Yang International Airport, 10 minutes from Xian Railway Station and offers ample parking. At Sofitel Xian we cater to your romantic requirements. Our staff take care to arrange the room according to your personal preferences, and we indulge honeymoon guests with sweet fruits, flowers and a delicious cake, welcoming you to Xian. Step into the serenity of Touch Spa and choose from a menu of soothing massages. Hot stones and expert hands knead you into bliss in one the twelve treatment rooms of our soothing Xian spa. 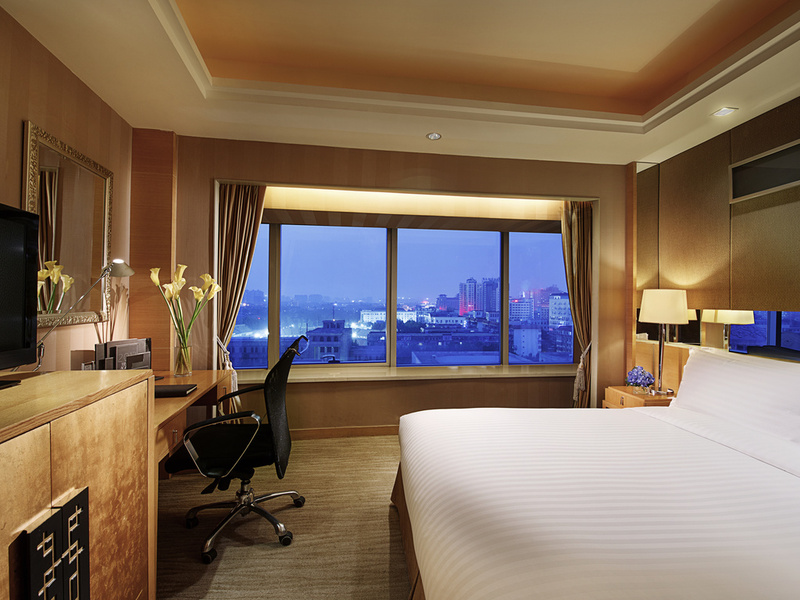 Benefit from the array of 5-star hotel leisure facilities and services at Sofitel Xian on Renmin Square. Stroll manicured Chinese gardens. Work out in the fitness centre. Relax at the pool or spa. Enjoy a lively game in the mahjong and snooker rooms. Explore the historical attractions nearby Sofitel Xian by walking 20 minutes to the Bell Tower and Muslim Quarter. We are located a 1-hour drive to the Terra-Cotta Warriors Museum. Let us customize an exclusive tour for you during your stay. Travel Xian in style with our limousine and chauffeur service. Return guests can enjoy an exclusive airport service on their fortieth hotel visit, and those returning the sixtieth time can enjoy four hours of car service to explore the city. Take a dip in our indoor heated pool or enjoy a poolside cocktail at Sofitel Xian. While you enjoy a swim or a relaxing moment in the jacuzzi, the kids can also take dip in their own pools, including a shaded pool for those hot summer days. For more active pursuits the state-of-the-art fitness centre offers a range of equipment to help you get your pulse up and your muscles pumping. Relax with a dip in the indoor heated swimming pool or Jacuzzi. Let your cares melt away in the sauna.